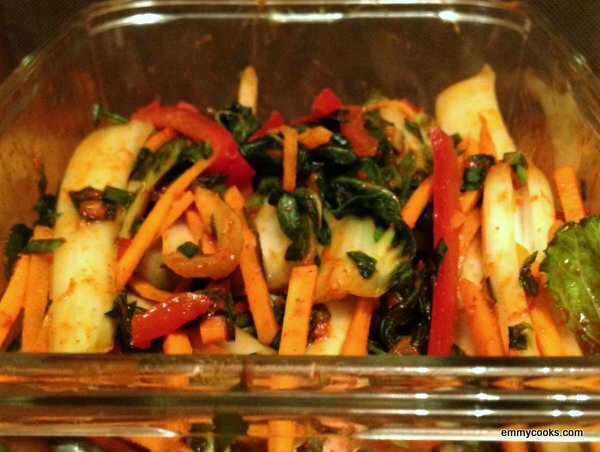 This entry was posted in Asian Flavors, DIY, Food, Vegetables By Themselves and tagged bok choi, fermentation, joi choi, kimchi, spicy on July 22, 2014 by emmycooks. The upside of seasonal eating has gotten enough play. Today we turn to its darker side. To the part of eating seasonally where summer ends and I am supposed to set aside perfect peaches for pumpkin soup and root vegetables. What kind of solace is that, I ask? In the coming weeks I’ll settle in, I know, remembering the unexpected heights that Brussels sprouts can reach and that miso-roasted squash and kale salad. I’ll even delight in planning our vegetarian Thanksgiving menu. Eventually. But for today, let’s talk about holding onto those peaches for as long as we can. 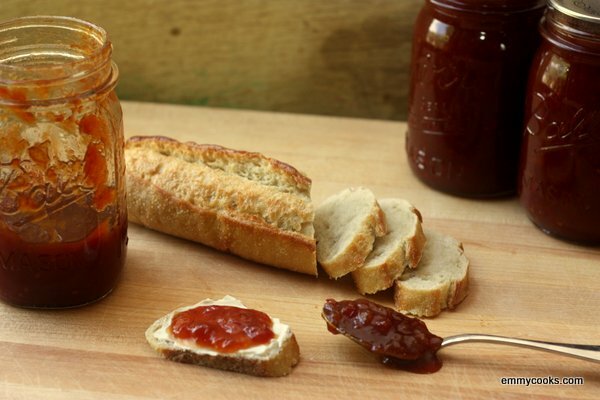 This recipe is the love child of this sweet tomato jam and this savory peach jam. It was inspired by a tomato and peach salad we ate all summer and a tomato and peach gazpacho served in the cafe of my favorite bookstore. And like all my good jam ideas, I later learned that Marisa had it first. This jam is equal parts peaches and tomatoes by weight, but the result is more sweet than savory; the umami notes of tomato and balsamic add just a whisper of intrigue. As you’d expect, it’s most at home alongside a soft cheese or spooned over a piece of salmon, but it’s no slouch in a sandwich or vinaigrette either. This entry was posted in DIY, Emmy Cooks Original, Food, Fruit, Preserving, Recipes, Sauces, Vegan or Would-Be-Just-As-Good-Vegan and tagged balsamic vinegar, canning, jam, peaches, preserving, tomato peach jam, tomatoes on October 17, 2013 by emmycooks. At 2 a.m. I was still in the kitchen. Peach jam in the canner, tomato jam out of the canner, three trays of fruit leather in the oven, tomatoes and peaches in the dehydrator, prepping zucchini relish. This is what I always forget in those dreamy, carefree spring months when I plant my garden or sign up for a CSA (or, this year, do both): The harvest season is also a season of all-out frenzy. This recipe is here to help. 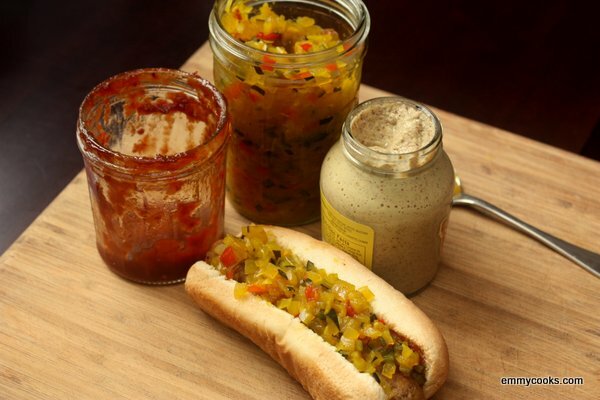 You will find both emotional and practical relief as you reduce two truly gargantuan zucchini to five tidy pints of the hot dog relish you remember from childhood. Pile it onto a field roast sausage with that better-than-ketchup (and I don’t say that lightly) tomato jam and a beery mustard, and you’ll almost forget about the boxes of ripe pears in the basement still awaiting your attention. This entry was posted in DIY, Feeding Kids, Food, Grilling, Preserving, Recipes, Sauces, Vegetables By Themselves and tagged canning, DIY, harvest recipes, preserving, relish, vegan, zucchini on September 18, 2013 by emmycooks. For the most part I’m a lazy cook, which is why I don’t get along too well with fava beans. 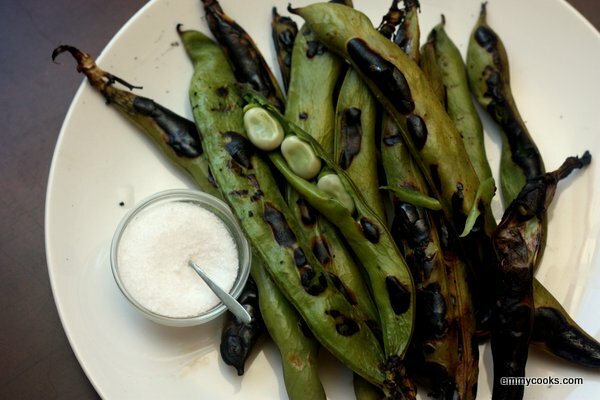 This entry was posted in Beans and Other Legumes, DIY, Easily Multiplies to Feed a Crowd, Food, Grilling, Recipes, Snacks and Apps, Vegan or Would-Be-Just-As-Good-Vegan, Vegetables By Themselves and tagged appetizers, easy, fava beans, grilling, salt, vegan, vegetarian on July 22, 2013 by emmycooks. Each summer, I fill my freezer and pantry shelves with jam and pickles and applesauce and roasted tomatoes and pesto and all the tastes of summer that I think I’ll need to make it through the Seattle winter. And each year, right about this time, I either start wondering where it all went or wondering how we’re ever going to get through it all. This year it’s the latter. So here we are: the chickens are laying again, green rows are peeking up in the garden, and although even the rhubarb is a few weeks off, all signs indicate that spring will come again. Which means that it’s time to be working through our winter stores. It was in that spirit that I hauled the last of our apple harvest out from the back of the fridge today. Last fall we borrowed two dehydrators from a friend and dried a few gallons of apples that lasted, oh, right until whenever the girls found them. They loved them. So today when the counter was piled high with apples and I started talking sauce, an intense lobbying campaign was launched from around the height of my bellybutton. Who could resist? This entry was posted in Baking, Desserts, DIY, Feeding Kids, Food, Fruit, Recipes, Snacks and Apps, Vegan or Would-Be-Just-As-Good-Vegan and tagged apple chips, apples, dried apples, drying fruit without a dehydrator, oven dried apples on March 12, 2013 by emmycooks. Welcome to Emmy Cooks! You can find some of my favorite recent recipes by visiting “My Favorite Recipes” (here are my lists for September, October, and November). If you like what you see here, you can sign up on the sidebar to receive a daily recipe by email, add the RSS feed to your blog reader, or follow Emmy Cooks on Facebook, Twitter, or Pinterest. 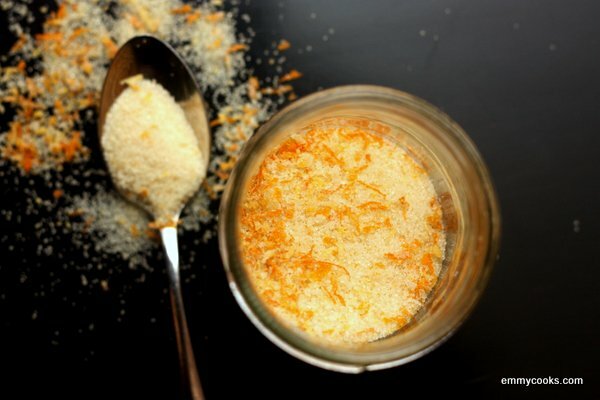 This entry was posted in Baking, Cookies, Desserts, DIY, Feeding Kids, Food, Recipes and tagged butter, caraway, cookies, holiday recipe, lemon on December 3, 2012 by emmycooks.